Six years since its last release, Nu Metal sensation Slipknot has finally returned with its new album, “.5: The Gray Chapter,” released Oct. 21 on Roadrunner Records. With the death of the band’s bassist Paul Gray and the departure of drummer Joey Jordison, fans were skeptical of what was to become of Slipknot’s sound. They wondered if the band they would distance itself even further than they had with “All Hope Is Gone” or return to their original sound. Thankfully, Slipknot has done the latter. Lead vocalist Corey Taylor returns with vocal ferocity. Jumping back and forth between harsh and melodic vocals, his voice is one of the more prevalent sources of variety on the album. Lyrics often feel like the frantic thoughts of a mad man and paint several songs with a dark mystique. The riffs are heavy, simple and to the point, at times serving as another rhythm section to drive the songs forward. With a combination of militaristic drumming and DJ-esque sound effects, the listener is filled with a welcome sense of anxiety and paranoia. This is a feeling signature to the band and is highly reminiscent of their self-titled debut. Not every song is a whirlwind of pounding aggression. The opening track, “XIX,” features faded drumming, a xylophone and ominous electronic melodies, with Taylor solely using melodic vocals. Other standout tracks include “Skeptic,” a tribute to the band’s departed bassist, and “Goodbye,” a sort of heavy metal anthem. These tracks are spread out throughout the album, giving the listener a break from Slipknot’s full-throttle song structure and providing much-needed variety. Overall, this is Slipknot’s most dynamic and praise-worthy album to date. This is an album that will get the listener’s mouth moving and head banging. 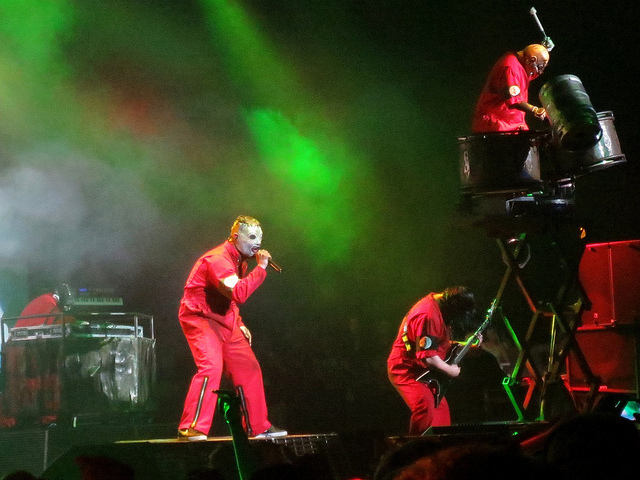 Slipknot’s classic frenetic energy is present and thriving.